There are plenty more where these came from! To see everything I pin, all week long, follow me on Pinterest. Now that the garden has been planted for over a month, I thought I'd fill you in on how it's been progressing in the past weeks. Aside from some started tomatoes, peppers and cilantro and mint popping up from last year, there wasn't too much going on back on May 15th. But check out how quickly things have come in just six short weeks! Thanks to the crazy hot weather and some diligent watering on my part (thanks to the crazy drought we've been experiencing so far this summer), there's some pretty good growth going on already in the garden. In fact, I've already harvested some of my first crop! I was noticing the radishes starting to pop out from the ground last week, so I pulled a couple and they looked good enough to eat to me! Then, right on cue two days later, SmartGardener e-mailed me saying the radishes were probably ready to begin being harvested. Awesome! Since then, I've picked about 12 radishes, which have been delectable in my lunchtime salads. Now that you know the radishes are all ready and rarin' to go, let's check up on some of the other veggies. On your left you'll see the first row of spinach I've planted. It's growing fine enough, but I'd like to have it a bit more plentiful. Plus, it looks as though some critters have been nibbling just a bit on one the front spinach bunch. Dirty varmints. To the right of that are my green pepper plants. The one up front has already produced two nice-sized green bell peppers! And to the right of the bell peppers is the jalapeno plant. Sadly, this little guy isn't doing so hot. Last year, I had a great amount of jalapenos growing, and this year it looks as though this plant (which I bought and planted as a start) won't be as bountiful. This tiny little jalapeno has kept this size for quite some time. Next to the jalapeno plant are bush beans. These fellas are growing quite nicely, especially coming up from seeds. They're currently flowering, and pretty soon I bet I'll see tiny little beanlings starting to grow! My star of the garden, so far, is the squash. It is growing like crazy! Although no little squashes are growing yet, the plant itself is creeping across the garden. It's making a run for the right side of the garden! Beyond the squash plants are the radishes (left) and Kohlrabi (right). As I mentioned before, the radish is mostly ready to go! I've been keeping an eye on it and picking what looks large enough for slicing and adding to salads as I go. And to the right of the Kohlrabi is another line of spinach. Over on the right side of the garden, things look just a bit more sparse now, but that's because I've allowed plenty of room for the cucumber plant to run amok the larger it gets. Remember how crazy my cucumbers grew last year?? It's already spreading out nicely this season! Next to the cucumber I've got some basil that took a while to pop up, but I have a feeling pretty soon it's going to burst with sweet basil leaves. And next to the basil are my tomato plants. I've got five out there (started and donated to our garden by our across-the-street neighbors), and I'm keeping especially close eye on them, seeing as how they're a totally new plant to grow for me. I hope those cages are soon overflowing with tomatoes! So that's the rundown of how the garden's looking, six weeks in. I'm hoping in six more weeks I'll have plenty to report about - hopefully I'll be feasting on most of what is just shooting up right now! Do you have a garden this season? What have you planted? Are you seeing good progress? As you may recall, Eric and I really enjoyed playing "Giant Jenga" while we were in Denver a couple of weeks ago. I'm a big fan of regular Jenga, and it turns out the larger you make it, the more fun it is. I don't know of any bars in Milwaukee that have Giant Jenga, and I certainly wouldn't wait around to discover a place that has it, so Eric and I decided to make our own Giant Jenga to play in the backyard. It's so incredibly easy I don't know why we didn't think of doing this before! We bought eight untreated 2x4x8 boards from Home Depot in order to have enough wood for 19 rows. Then, Eric took the boards and measured and marked off every 10.5" to cut. Our neighbor, Andy, was kind enough to let us borrow his circular saw to cut our boards. So Eric got to work on that after measuring and marking. Then, after all 57 boards were cut (19 rows of three 10.5" long boards), we sanded them down to smooth things out, then wiped each board down with a wet towel to clear away any sawdust and residue. And that's it! Easiest project EVER. We finished (or, Eric did...) it in one short night after work. And the total cost? About $16 just to buy the lumber. I'd suggest, as you're playing, to keep a permanent market nearby so you can write down quotes, funny expressions or inside jokes on each of the boards. Whenever we've played Jenga at a bar, one of my favorite things is reading all the random (usually suggestive) things people have written all over the boards. 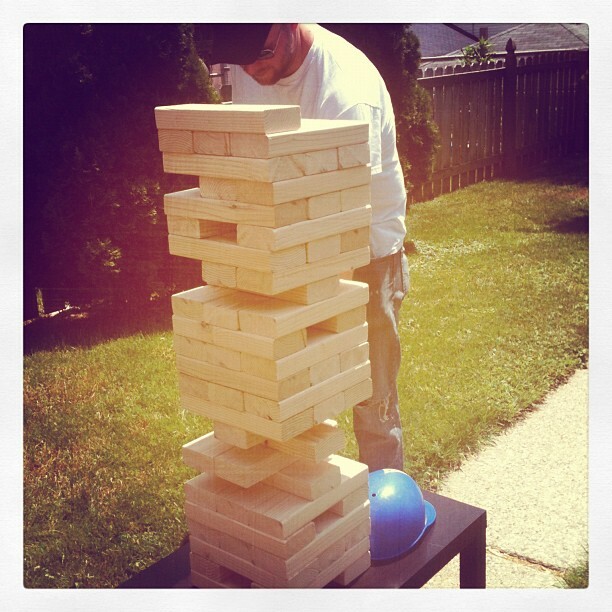 When we played on Saturday, I (sadly) was the first-ever loser in our backyard giant Jenga. So Eric wrote "Rachel is the first loser: 6/16/2012." So now everyone will know how much of a loser I am in the years to come. How delightful. If you're playing outside, find a sturdy table to take outdoors (one you wouldn't care if it got a little dinged up). We brought out on old coffee table that we keep in our basement. We also provided an old Brewers hard hat for head protection in case the boards topple over on you if you're bent over, pulling a board from the bottom row. That hard hat got used quite a few times on Saturday! This game is perfect for just passing time on a beautiful day outside. It's cheap, fun, and everyone already knows how to play! Bonus points for the ability to hold a drink while maneuvering the boards.